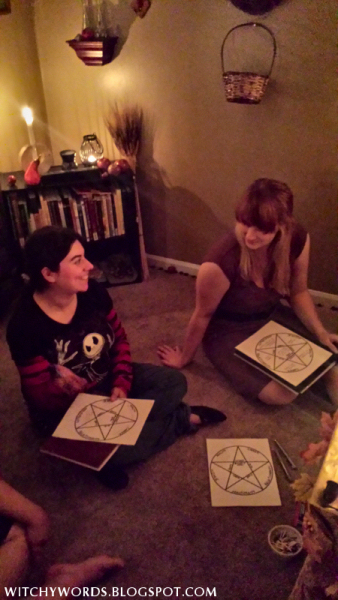 In our last esbat ritual, you may have noticed these worksheets being filled out. Lauren asked if I could post it for everyone else to fill out as well! What exactly is this worksheet? 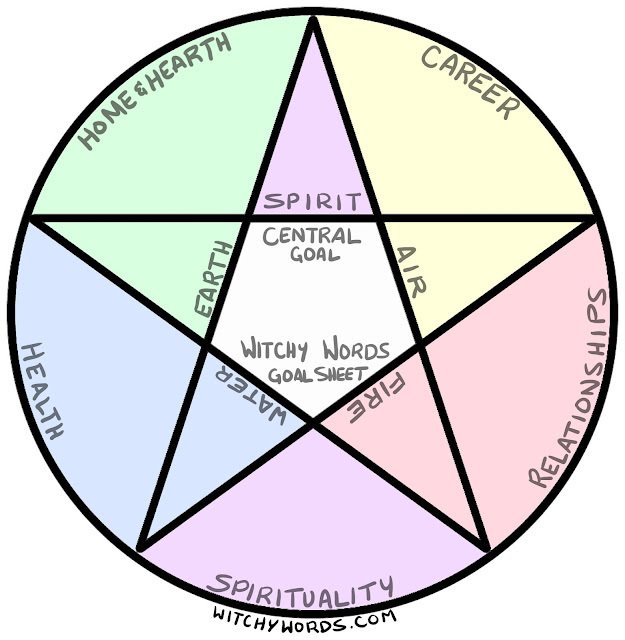 This covers the basic areas of life as relative to the five elements. To fill the worksheet out, contemplate each area and think of at least one goal that would help you improve that aspect of your life. When should I fill the worksheet out? To be honest, we filled ours out pretty early. 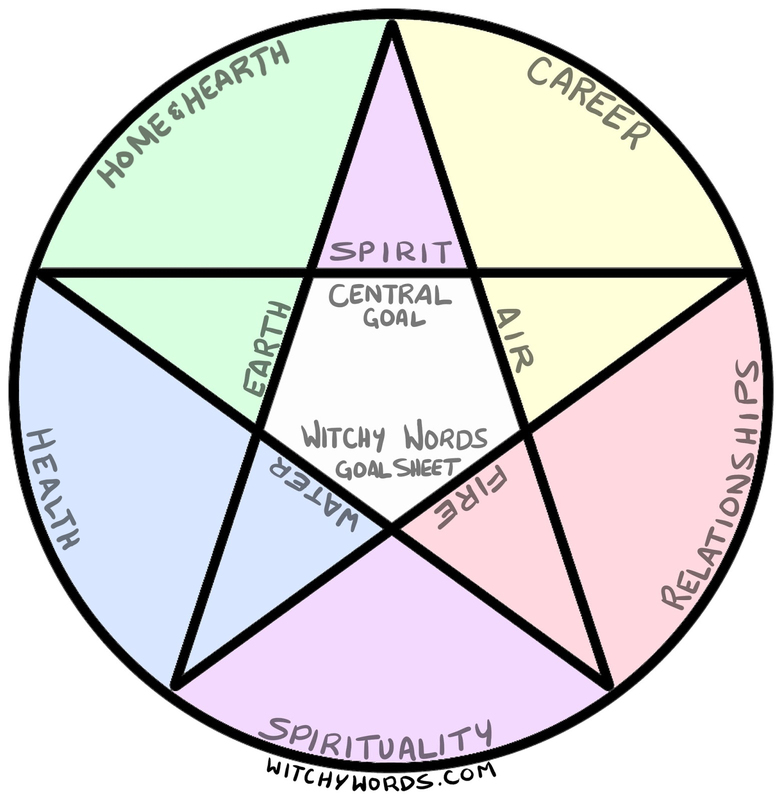 I wanted to get the Circle thinking about next year's goals and asked them to quickly jot down just one goal in each section. 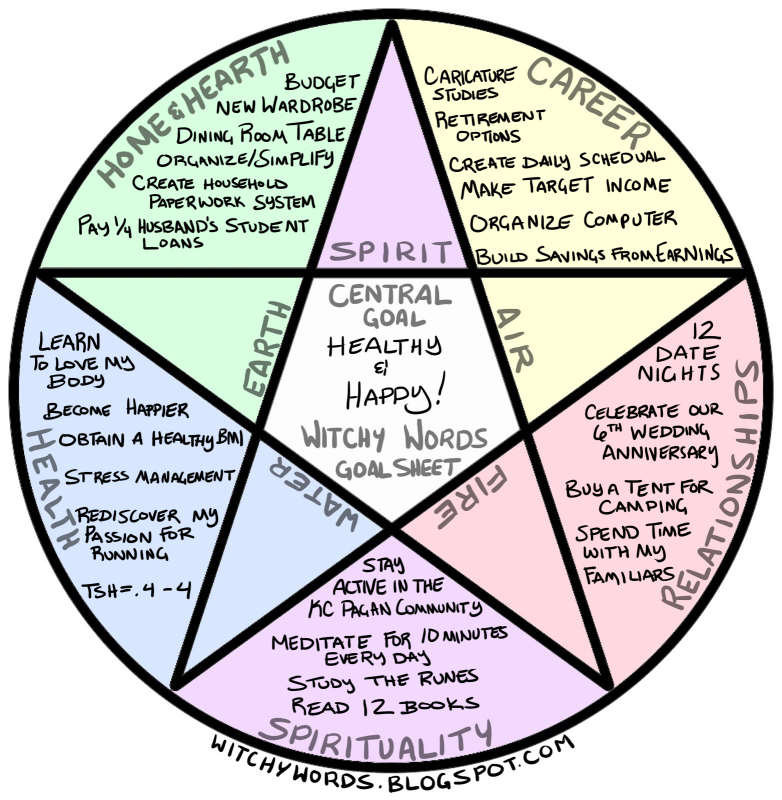 The Wheel of the Year tells us that the end and beginning of the year is Samhain. As a natural cycle, I agree. However, the rest of the world operates on a January - December schedule. My Esbat Correspondence Sheet reflects that cycle. While you are welcome to fill this out on the full moon closest to Samhain, my suggestion is the Long Night Moon, which comes in December. Can you show me an example worksheet? Here's a detailed copy of mine! Hi, I love your goal sheet, thanks for sharing. I do better breaking my goals down so I am thinking one for the year and 1 for each season, basically just to break down the major goals. Again thanks so much for sharing. I think that's a fantastic idea! Thank you for reading! I LOVE LOVE this. Thanks so much for sharing. THis will defintely be on my to do list. Just came across your blog!! Thanks for sharing this post! AWESOME IDEA!! If I fill this out and do a post on it, I will definitely share your link!! Thank you so much! I hope you had a Merry Mabon as well! I love this. I do this thing where I set goals for the month every new moon, and this chart looks like it can be adapted to that purpose as well. That sounds very similar to what we do! We set small goals on the full moons, typically rounded out by setting much larger goals on the last full moon of the year. You're more than welcome to use this worksheet however you need. You're very welcome! Thank you! You're very welcome. Thank you! Thanks for sharing this, I am going to do this with my boys ( 10 and 8) this weekend. Hello! I am juuust starting out on this pagan thing and, though I'm excited about a lot of things, doing this worksheet looks like a lot of fun and really helpful! I can't wait to do it! What a great idea! I will include this in my spring equinox ritual tonight. We have a super moon on the equinox this year! How incredible is that?